In 1738, Alexander Woods, a Limerick linen manufacturer leased the old medieval parish of Inis Cealtra from the Daly's of Dunsandle, County Galway. The rent of this 10,000 acre holding was to be a mere "peppercorn" for the first four years, on condition that he would build before the first of April 1742, "50 staunch and tenantable houses fit for tradesmen and manufacturers to dwell in ", a slated house for religious worship, a school and a market house. He was also compelled to lay aside twenty acres of parkland, and to make leases for lives of those premises to "fifty god protestant freeholders." Alexander Wood’s plan centred on the ‘Flax Culture’, which would give both agricultural and manufacturing employment to a lot of people. He offered leases for lives of between one and one hundred acres to protestant weavers and farmers. No Catholic need apply, as this was the infamous era of the Penal Laws. It was with a pioneering spirit that families from all over Ireland crossed the Shannon River into a region known in history as “a Corner of Contention”. One hundred years earlier Cromwell had decreed that no Papist could reside within one mile of the Shannon. In 1690, John Stephens, an English Catholic Infantry Officer in the army of King James, wrote in his diary that “At Scarriff begins one of the most desert, wild, barbarous mountains that ever I beheld and runs eight miles outright, there being nothing to be seen upon it but rocks and bogs, no corn, meadow, house or living creature and not so much as a bird’. Undaunted, Woods put his plan into action and by 1751 he had seventy girls working in a spinning school and several weavers, shoemakers, carpenters, blacksmiths etc. working in the village. The location was both practical and inspired. The village has an idyllic setting, lying as it is beneath the lunar-like, heather coated, hills and forested valleys of the vast, natural parkland of the Sliabh Aughty Mountains and overlooking a bay neck-laced with islands of uncanny shape and deep foliage. The uniformity of architecture, combined with its tree-lined street, gives the village dignity and grace and contrasts sharply with modern towns “with their long infected rows, they call the streets”. Mountshannon in 1981 won the coveted title of Ireland’s Tidiest Town. By 1766, Alexander Woods was dead and the downfall of that family commenced. His only son, who died soon afterwards, succeeded him and his grandson, also called Alexander, was dead by 1790. These untimely deaths and a subsequent determined effort by the English Government to curtail Irish manufacture brought about the downfall of the Linen Industry in the parish. In 1796, De Latocnaye, a Frenchman, writing in his “Walk through Ireland” said the town was in ruins. Two landlord families, Read and Tandy, now picked up the ‘threads’ and for the next 130 years those families were to play the dominant role in the social and political life of the parish. 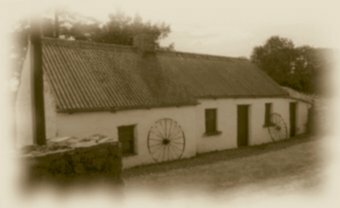 The Tandy's were primarily absentees and it is worth noting that their half of the parish, which included the village, fared badly during a period of great distress in the 1820’s and again during Ireland’s hour of greatest need, during the Famine of 1845-49. During the first 50 years of the 19th century every conceivable act of violence and wanton destruction was levied on the inhabitants. Demand for drink led to the conversion of the Catholic Chapel in 1809 into a malt house. By 1820 the Protestants of Mountshannon numbered 302 and the Catholics 1,500. On fair days, violence would reach its peak and ‘shillalah’ and ‘sugan’ wielding drunks would either fight among themselves (faction fighting), or more usual against their Protestant neighbors. Protestant families that could afford to emigrate did so. This annoyed greatly their Protestant landlords. In 1819, ten families sought assistance to immigrate to Canada and by 1823 the number had risen to 48 families. The Famine and its effects reduced the population from 2510 in 1841 to 1,457 in 1851. This differential, however distressing, would have been much greater were it not for the efforts of Philip Read, the local landlord, in alleviating the suffering of his tenants, by spending £10’000 on various work projects and in supplying food for the destitute. The second half of the 19th century was a period of relative prosperity and huge tracts of land were brought into production. Both the Read and Tandy names died out and the Irish Land Commission took over and divided their estates in the 1920’s. In 1898 the parish, along with the neighboring parish of Clonrush, (Whitegate), were removed from County Galway and were ‘stitched on to County Clare by the ‘powers that were’. Both Whitegate and Mountshannon are now proud to be part of County Clare. In recent years there has been unprecedented growth in the number of new houses in Mountshannon particularly holiday homes. While some of it is to be welcomed, it is imperative that the woeful situation so aptly described by Oliver Goldsmith, will not materialize. “I’ll fares the land, to hastening ills a prey, where wealth accumulates and men decay”.